Their debut album had some o.k. reviews and that brought them gigs on the Metalfest Open Air 2012 and the popular mega event 70000 tons of Metal. Special about this band is that they are a six piece with two singers. Lars Bittner takes care of the clean singing and Kristo Balic take care of the harsh ones. After the first spin I wasn't blown away, not because the music is bad, far from that, but because they do not have something I haven't heard yet. I know it isn't easy to make something that hasn't been done before, but I can't help it that I am a little less enthusiastic because of that. 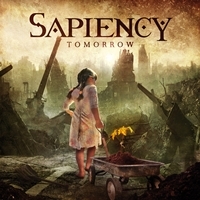 Sapiency does everything right, the songs are o.k., the musicians are good and the sound of the album is aggressive. The formula they use is a mix of In Flames, Soilwork, Scar Symmetry and Sonic Syndicate. If these bands wouldn't exist, this album would be a hammer. Now the combination of melo death, thrash riffs and the clean/harsh singing isn't new and it has been done too many times before. Still the album is a nice one to listen to from start to finish and the fast blasting tempo in "Unknown Enemy" is something I sure want to hear more of. I think that especially Sonic Syndicate fans will find this an interesting album. A fine release, but not special enough to reward them with a more than average rating.